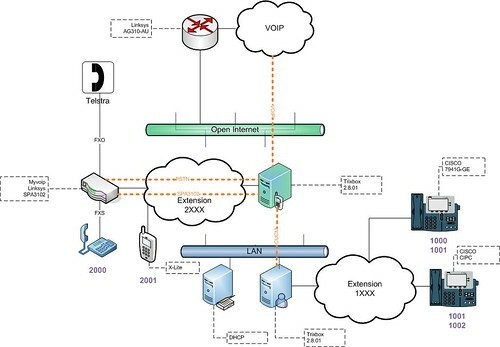 This is a basic guide how to create a small VOIP network at home. I am using Cisco Unified Communication Manager, Trixbox and Linksys SPA3102 as the main infrastructure. Furthermore, Cisco IP Phone 7941G-GE, Cisco IP Phone CIPC and X-Lite are the IP Phones installed. The configuration is basically having CUCM to handle 1XXX extensions and Trixbox to handle 2XXX extensions. Tribox is central IP PBX to handler outgoing and incoming calls. Trixbox is configured to have 2 NICs - one in located in front of firewall and the other one is located behind the firewall. The reason is because my firewall is not SIP friendly!! Add a new oneRoute Pattern* = 0.!